The pinger and ponger states are parallel states, i.e. they are entered simultaneously and will take transitions independently of eachother. The pinger state will post the first ping event upon entry; the ponger state will respond by posting a pong event; this will cause the pinger state to post a new ping event; and so on. Two custom events are defined, PingEvent and PongEvent. 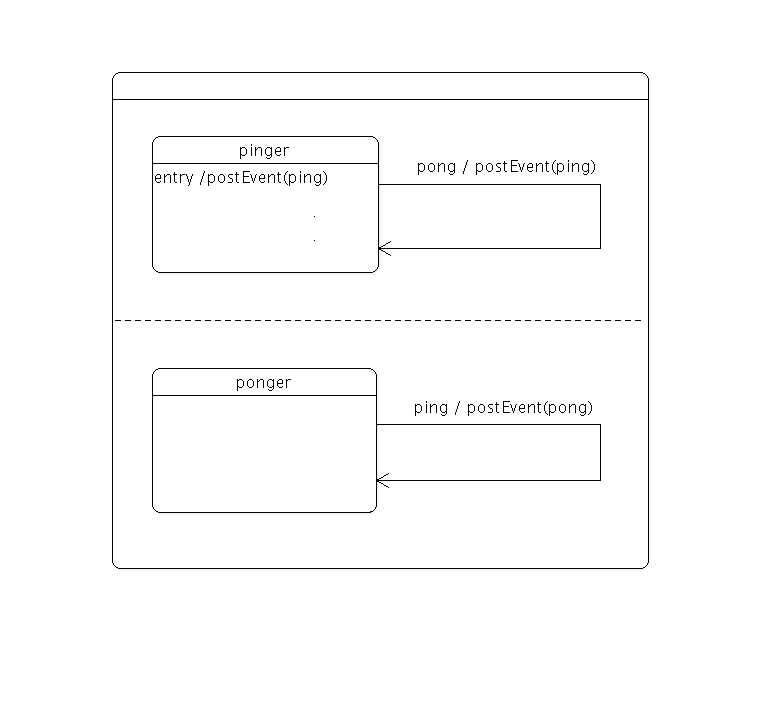 The Pinger class defines a state that posts a PingEvent to the state machine when the state is entered. The PingTransition class defines a transition that is triggered by events of type PingEvent, and that posts a PongEvent (with a delay of 500 milliseconds) to the state machine when the transition is triggered. The PongTransition class defines a transition that is triggered by events of type PongEvent, and that posts a PingEvent (with a delay of 500 milliseconds) to the state machine when the transition is triggered. The main() function begins by creating a state machine and a parallel state group. Next, the pinger and ponger states are created, with the parallel state group as their parent state. Note that the transitions are targetless. When such a transition is triggered, the source state won't be exited and re-entered; only the transition's onTransition() function will be called, and the state machine's configuration will remain the same, which is precisely what we want in this case. Finally, the group is added to the state machine, the machine is started, and the application event loop is entered.